Collapse into comfort when you've got the Gloria Wood Collection. 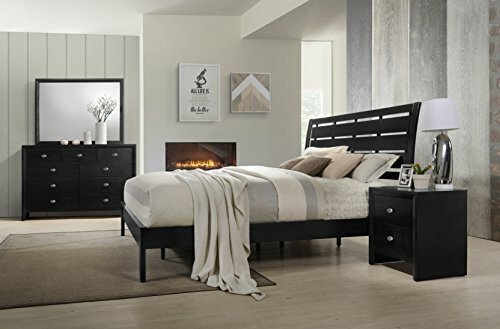 This contemporary bedroom set is crafted with hand selected woods and veneers in black finish featured a modern slatted headboard design. Supported by sturdy tapered legs, it's the perfect place to catch some zzz's at the end of a long day. Search "Gloria350" for the whole collection. Relax in the soothing space in our Isola bedroom set. 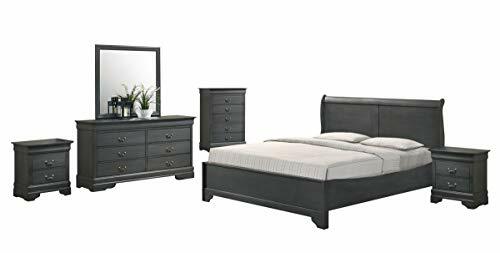 Set includes one sleigh queen size bed, one 6-drawer dresser and mirror and one 2-drawer nightstand. Smooth lines form the exquisitely crafted bed. Elegant headboard curve and unique Louis Philippe style bring a tranquil feel to your master bedroom. Traditional curves form the wood dresser and mirror and nightstand. A rich cherry finish and custom-designed style creating a warm and comforting feeling, that you will harvest a rich, calming surroundings at every single night. Relax in the soothing space in our Isola bedroom set. 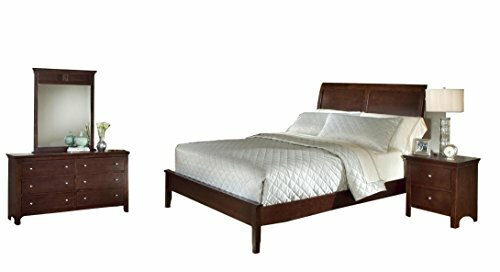 Set includes one sleigh queen size bed, one 6-drawer dresser and mirror and two 2-drawer nightstands. Smooth lines form the exquisitely crafted bed. Elegant headboard curve and unique Louis Philippe style bring a tranquil feel to your master bedroom. Traditional curves form the wood dresser and mirror and nightstands. A rich cherry finish and custom-designed style creating a warm and comforting feeling, that you will harvest a rich, calming surroundings at every single night. 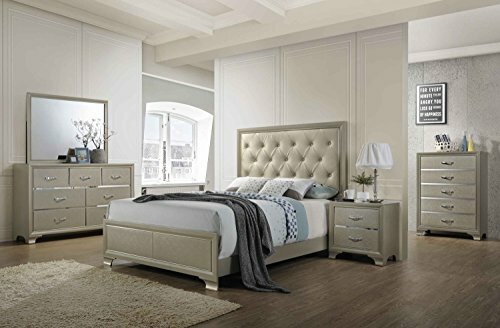 Give yourself and family a wonderful sleep with the Laveno 012 white Bedroom Series, including one 7-Drawer dresser & mirror, two nightstands and one queen size bed. This series is beautiful centerpiece with a traditional white finish and timeless panel styling. All furniture's are crafted from Solid Wood Construction, features S shape feet to serve and support. This classic design and bold style add a special feature in your bedroom. 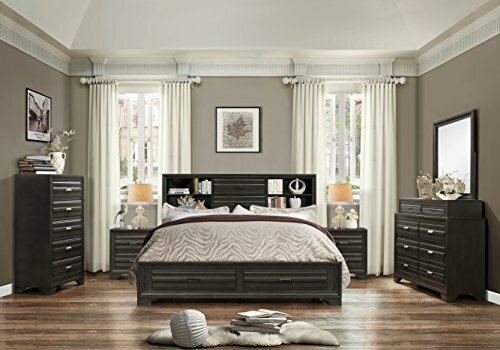 Storage and style come together to update your master bedroom with this collection. Storage options include a dresser or chest with drawers for clothing, bedding and more. The storage beds give you even more functionality. The headboard features shelves and drawers while the footboard also features drawers. Style features include simple horizontal pulls and textured drawer fronts all in an antique grey finish. Search "Loiret 236" for the whole collection. Full Set up: 62.91"W X 91.04"D X 53.62"H; Queen Headboard: 62.72"W X 8.74"D X 53.62"H; Footboard: 62.91"W X 1.3"D X 16.77"H; Dresser: 58.27"W X 16.54"D X 39.69"H; Mirror: 39.37"W X 1.06"D X 34.80"H; Night Stand: 23.62"W X 16.54"D X 23.62"H.
Storage and style come together to update your master bedroom with this collection. Storage options include a dresser or chest with drawers for clothing, bedding and more. The storage beds give you even more functionality. The headboard features shelves and drawers while the footboard also features drawers. Style features include simple horizontal pulls and textured drawer fronts all in an antique grey finish. Search "Loiret 236" for the whole collection. Full Set up: 62.91"W X 91.04"D X 53.62"H; Queen Headboard: 62.72"W X 8.74"D X 53.62"H; Footboard: 62.91"W X 1.3"D X 16.77"H; Dresser: 58.27"W X 16.54"D X 39.69"H; Mirror: 39.37"W X 1.06"D X 34.80"H; Night Stand: 23.62"W X 16.54"D X 23.62"H; Chest: 31.5"W X 16.54"D X 47.8"H.
Relax in the soothing space in our LE Charmel queen size low profile bedroom set. It includes one queen size bed, one dresser and mirror and two nightstands. Elegant solid wood bed is covered in a rich dark cherry finish with decorative baseball stitching. The contemporary low profile style is sure to bring a tranquil feel to your master bedroom. Dresser & Mirror and nightstands feature a clean case shape, with classic crown molding. Spacious drawers will meet all of your bedroom storage needs. 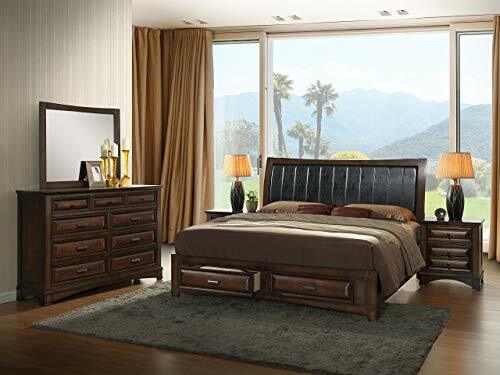 Place this bedroom set in your home and you will harvest a rich, calming surroundings at every single night. 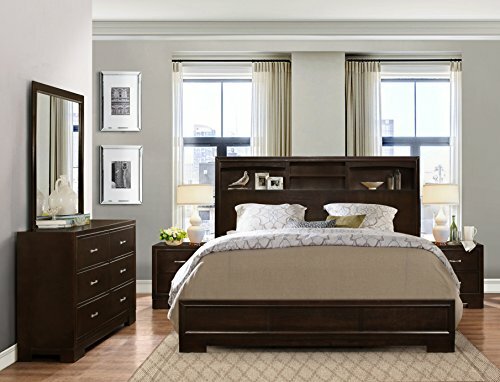 Elevate the comfort of your bedroom for decades with the Seasons Five Piece Bedroom Suite. 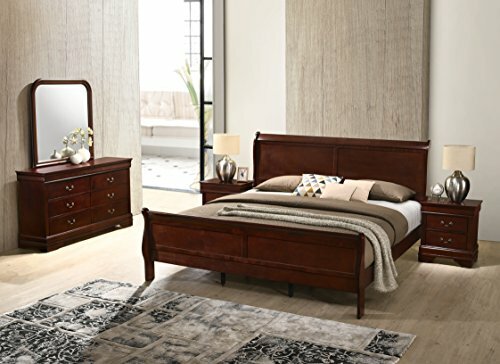 This expertly-crafted collection includes an adjustable full/queen headboard, dresser, mirror, chest, and nightstand. 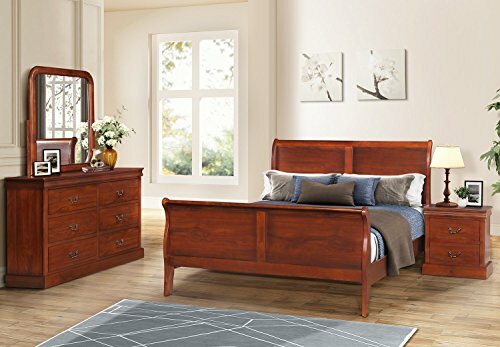 Featuring a stylish cherry star color finish and a nightstand with two drawers for maximum storage space, this stellar bedroom collection is beautiful, radiant and built to last for years. The suite's headboard and mirror feature an artistic leaf-and-vine embossing design that showcase a French Country style. 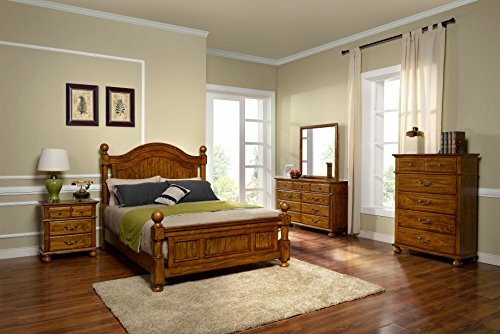 The Seasons Five Piece Bedroom Suite will add warmth, style and comfort to any bedroom setting. 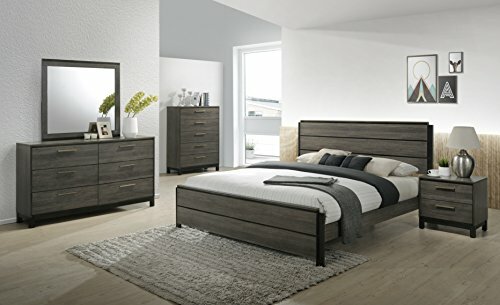 The stunningly beautiful walnut veneer finish on this modern bedroom set turns any bedroom into a sophisticated retreat. The bedroom will become instantly upgraded. 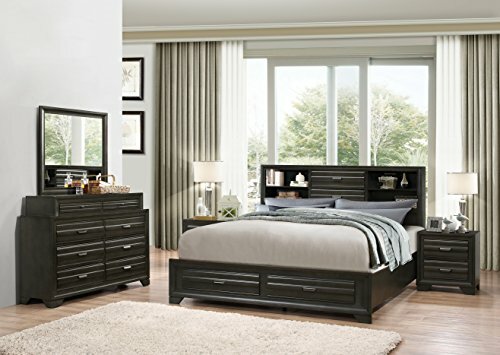 This contemporary Blemerey bedroom set will become a stunning centerpiece for your modern bedroom. Set includes 1 queen bed, which features 8 drawers. One 8-drawer dresser and mirror and two 3-drawer nightstands meet all of your bedroom storage needs. The ebony finish is striking and will go with many different color palettes. 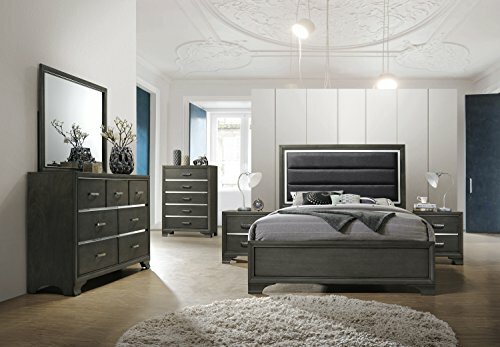 This stylish bedroom collection will become a staple in your modern bedroom. 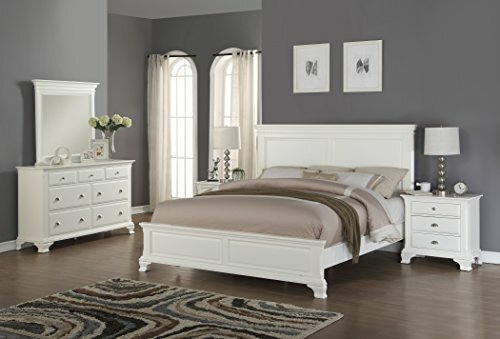 Relax in the soothing space in our LE Charmel queen size low profile bedroom set. It includes one queen size bed, one dresser and mirror and one nightstand. 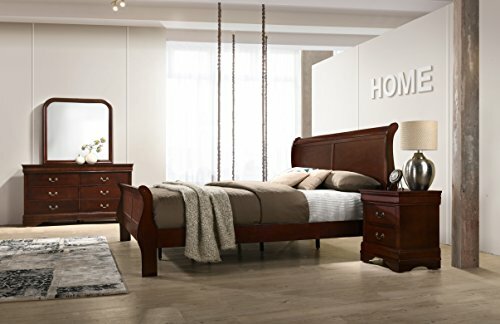 Elegant solid wood bed is covered in a rich dark cherry finish with decorative baseball stitching. The contemporary low profile style is sure to bring a tranquil feel to your master bedroom. Dresser & Mirror and nightstand feature a clean case shape, with classic crown molding. Spacious drawers will meet all of your bedroom storage needs. Place this bedroom set in your home and you will harvest a rich, calming surroundings at every single night. 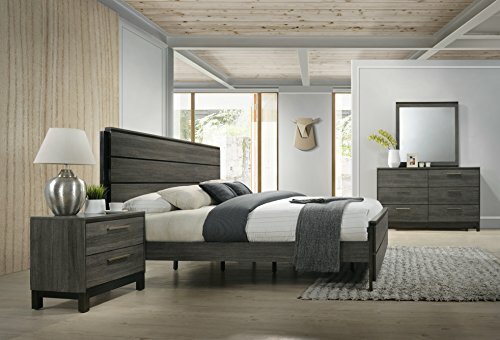 Elegant meet contemporary, the bedroom collection "broval 179" from Roundhill Furniture brings everything about comfort, function, style into your home. Makes a bold decorating statement with its deep, rich espresso color and substantial presence. 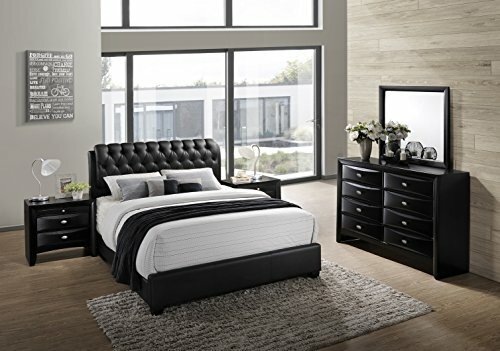 The bed features two spacious storage drawers at the foot of this platform bed, and a black PU leather insert headboard. The solid wood box frame prevents any worries about dust bunnies or errant shoes beneath the bed. Search "broval 179" for the collection.